The new version of Gams-mode has a new feature that I like very much. It allows you to use an outline-mode in your gams files. It is called org-mode, which is a major mode in Emacs. 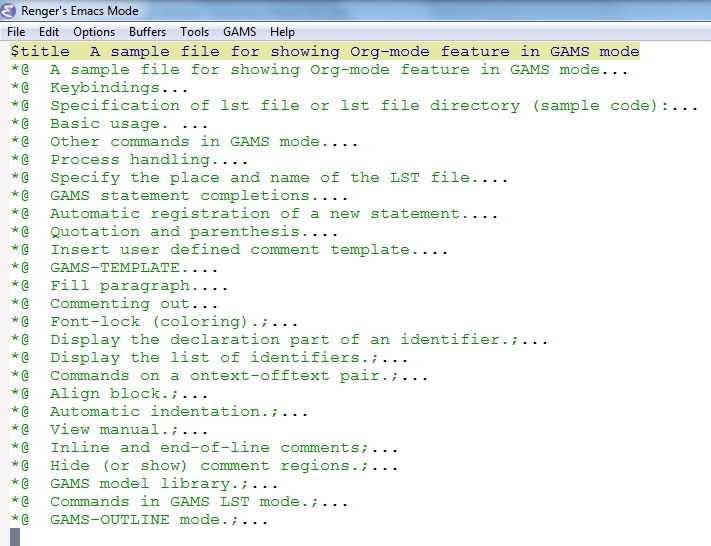 Let us have a look at the file org-minor-mode.gms. This file can be found in your gams-mode directory. This file contains all the help for gams-mode. All the help topics have a section title that starts with *@. This is great! Now, instead of scrolling or searching, you can just cycle through the different display possibilities using Shift-Tab (org-global-cycle), or if you want to see or hide the content of a certain section, hit Tab (org-cycle).